BallinEurope doesn’t actually get to vote for Euroleague Coach of the Year, but we can still pretend. And in BiE’s opinion, the question of who should get the honor comes down to three, interestingly enough each in his first season with his current club. If BiE had a ballot, the no. 3 spot would go to Zan Tabak. The main knock against Tabak is of course the fact the rookie Euroleague head coach took the reins of then-Caja Laboral some seven games into the season – but at that point, the Baskonians stood at just 1-6. Having to wing it in EL regular-season week eight against Zalgiris Kaunas, Tabak could do little about his new team’s taking yet another loss; at this point, who remained on the Baskonia bandwagon? Tabak to Lampe: Listen, Maciej — you’re the man, you know? And then, Tabak reworked a talented team that somehow never clicked with Dusko Ivanovic. Out went Taylor Rochestie and, perhaps seeing a bit of himself-as-Jugoplastika center in Maciej Lampe, in came an outside-in game – as did the wins. Laboral ran off a seven-game win streak and, though followed up with six consecutive losses, the team did not quit on Tabak as they had on Ivanovic. CSKA Moscow may have given Baskonia a bit of a spanking in the EL quarterfinal round, but the fact that Tabak was steadying influence enough to help the team squeak through to the playoffs is indeed impressive – and in addition, Laboral will go into the Liga Endesa tournament in the no. 2 spot. Not bad at all for a first (almost) season as coach. After this, it’s not so easy. BiE doesn’t really wish to start a Red-Green conflict here, but it seems unavoidable: The big league’s top two coaches for 2012-13 are surely Georgios Bartzokas of Olympiacos and Argiris Pedoulakis of Panathinaikos, who took their respective Greek squads to unforeseen heights this season – each by taking a different path. Certainly many European basketball aficionados reckoned that the Reds would remain in contention, but replacing the legendary Dusan Ivkovic with a guy who boasted just a 6-10 lifetime record in Euroleague play shied a majority away from figuring Olympiacos could pull off an ultra-rare repeat title. More significantly, Bartzokas went against the grain of current common wisdom by nearly standing pat in both gameplan and roster, sticking with eight members of the 2011-12 championship-winning side: Pero Antic, Martynas Gecevicius, Kyle Hines, Vangelis Mantzaris, Kostas Papanikolaou, Giorgos “Agent 00.7” Printezis, Kostas Sloukas, and of course Vassilis Spanoulis. 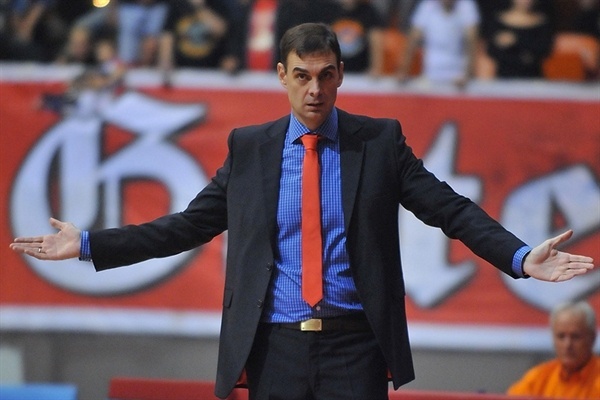 Bartzokas and Olympiacos’ 2012-13 campaign proved one thing: That consistency can win titles. On the other hand, Pedoulakis and Panathinaikos presented nearly the exact opposite case (excepting that, like Bartzokas, Pedoulakis was also promoted from the Greek League to occupy the place of a coaching giant). The teeming masses guessed that PAO would focus on rebuilding this season, bringing back only Dimitris Diamantidis and Kostas Tsartsaris from the previous year’s squad – but it seems no one informed Pedoulakis. With a combination of Euroleague veterans (including Sofoklis Schortsanitis, James Gist, Stephane Lasme, Roko Ukic, Jonas Maciulis), Greek Leaguers (e.g. Vasilis Xanthopoulos) and various journeymen (Michael Bramos, Marcus Banks), Pedoulakis created a compelling mix that got PAO to within one win from the Final Four round. So should BiE await the outcome of tonight’s Olympiacos-Real Madrid championship game to see if Bartzokas and the Reds can pull off an astounding post-coach switch repeat? Or has Pedoulakis impressed enough? Let us know with a comment – or simply vote here. Georgios Bartzokas: “We have to forget the CSKA Moscow game immediately”Poll: Who should be the 2013 Euroleague Coach of the Year? I say Barztokas first and Pedoulakis second. They both have don amazing jobs. It’s not even a question. He took a brand new team to play against Barca in TOP 8 and lost only because his players had a bad shooting night. On the other hand, almost all coaches should be able to take OLY (the champs), to get to top 8 and get 1 victory there. So Bartzokas is managed to take 2 more, and win the 1st game of the FF.